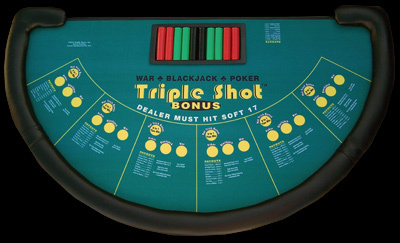 Triple Shot Bonus is a new three-game table game. It is three games in one: War, Blackjack and Poker. The three bets are independent, so the player can bet any amount on each one, subject to table limits. Players will place their bets at the start of each round and will win or lose each game individually. The three games are played in succession, using the cards from the previous game to complete the next game.